I’ve been curious about the SAMD20 processors for a while now. They were originally produced by Atmel who have since been bought by Microchip. The SamD20 MCU’s are Cortex M0+ parts with the usual sorts of onboard peripherals. I was interested in programming this part from the ground up with my own header files, linker scripts and so on. Initially I had no success with OpenOCD (version 0.10 supplied with Ubuntu) so I went and downloaded a slightly more recent source code snapshot (0.10.0+dev-00382-gbe87994d). This mostly works. I can reset the chip, halt it, examine registers and program it using a slightly out of the way syntax. Single step debugging and breakpoints work too. The main problem is with the load command in arm-none-eabi-gdb: it just won’t program it. There is a workaround however as shown below. Note: I’m using an ST-Link-V2 clone to program the chip. The openocd configuration file is in the git archive for this project (see below). The debugger connects via SWCLK, SWDIO. 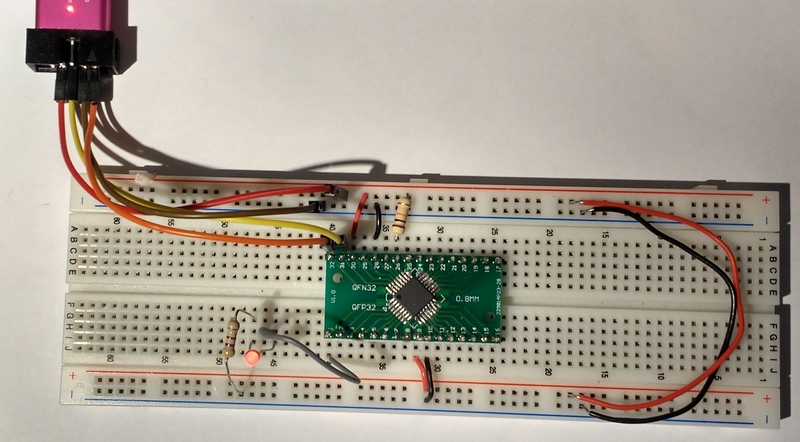 VDDIN and VDDANA are connected to 3.3V and the various GND pins go back to 0V. The Reset pin is pulled up to 3.3V using a 10k resistor. The header file samd20e16.h was written using peripheral addresses obtained in the datasheet. The github repository is available here. I hope to grow this to include the other peripherals over the next week or two.